Luc Belaire, the world's fastest-growing brand of premium French sparkling wine, is proud to present LUC BELAIRE GOLD, a blend of handpicked Chardonnay and Pinot Noir grapes crafted in the heart of Burgundy, France. With unique elements like an organic sugarcane dosage, a style popularized in 1920s France, and a crystal-clear glass bottle with intricate embossed foil labels, the new cuvée is positioned to be the flagship of the Luc Belaire line. As the celebrity drink of choice, Belaire is also thrilled to announce global superstar DJ Steve Aoki as Belaire Gold's first official brand ambassador. Brett Berish, CEO of Sovereign Brands, owners of Luc Belaire, said, "We are incredibly excited to introduce Belaire Gold to the world. We have an unrivalled ambassador network of Belaire fans and are pleased to welcome Steve, whose awe-inspiring creativity and celebratory spirit make him the perfect ambassador for our 'liquid gold.' We will be integrating the Aoki experience with Luc Belaire, both online and in Steve's performances, to create fun, engaging content for our friends and followers." Aoki joins more than 200 global ambassadors for Belaire, including music industry titans like Rick Ross and DJ Khaled as well as championship-winning athletes from several different sports. 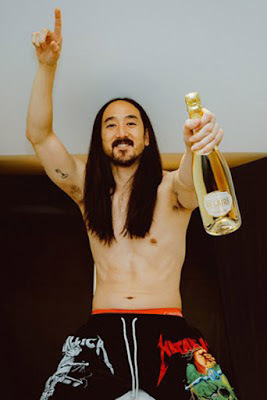 Aoki said, "I'm a longtime fan of Belaire and have already worked with the brand on a series of music videos last year. Since then, I've become even more excited about the brand, the team and everything they stand for. When I heard about the opportunity to be a part of it all with Belaire Gold, I had to do it." Belaire Gold's perfect balance of fresh Chardonnay fruit with hints of peach, pear and brioche will be rolling out to select retailers, restaurants and nightclubs around the world in July. For more information and to stay updated on upcoming events, fans are encouraged to visit LucBelaire.com and join the #BelaireGold conversation by following @OfficialBelaire on Instagram, Facebook and Twitter. Luc Belaire is a premium brand produced in France - the hallmark of quality in the world of fine wines. Our 5th and 6th generation father-and-son winemakers oversee production of each bottle of Belaire at their maison in Montagny-les Beaune, established in 1898. Luc Belaire Gold joins Belaire's signature cuvée Belaire Rosé, a unique sparkling Rosé wine from the south of France crafted from a blend of Grenache, Cinsault and Syrah grapes - the three favorite Rosé grapes of the region, and Belaire Luxe, an elegant 'blancs de blancs' made exclusively from 100% Chardonnay grapes with a special dosage made from prized Chablis grapes in Burgundy. Sovereign Brands is a family-owned, international wine & spirits company headquartered in New York. The company is owned and operated by the Berish family and partners with first-class producers from the world's most iconic wine and spirit regions to develop superior brands. The company created the Armand de Brignac ("Ace of Spades") Champagne, selling the brand in 2014, and created the D'USSÉ Cognac brand (currently operated by Bacardi Ltd.). Sovereign has a portfolio of successful brands including Luc Belaire, a smash-hit line of French sparkling wines, which has earned global acclaim for its exquisite taste and striking packages, and is available in more than 100 countries around the world. The company's brands also include Cloud Chaser, a classic French Côtes de Provence Rosé, and Skeleton Vineyards, a range of accessible wines from Argentinaand Austria. Steve is a 2x Grammy-nominated international producer/DJ, electronic dance music entrepreneur, and founder of the trendsetting record label, events/lifestyle company and apparel line Dim Mak. Since launching in 1996, Dim Mak Records has become a launch pad for seminal acts such as The Chainsmokers, Bloc Party, The Bloody Beetroots, Klaxons, and The Gossip through deftly marketed single and full-length releases and now has more than 800 releases to date. As a solo artist, AOKI has become a force of nature averaging over 250 tour dates per year. His recent release "Just Hold On" with One Direction's Louis Tomlinson, which debuted at #1 in 43 countries and has since achieved Gold or Platinum status in 18 countries. Steve's Grammy-nominated Netflix Original documentary "I'll Sleep When I'm Dead", released in August 2016, debuted at the Tribeca Film Festival last spring to a sold-out audience and received a 2016 Grammy nomination for "Best Music Film". His forthcoming album Steve Aoki Presents Kolony, due for release July 21 via Dim Mak Records / Ultra Records, marks Aoki's first full turn into rap music, with nearly 10 years of hip-hop collaborations, which he describes as "bridging the gap" between genres and is stacked with hard-hitting rhymes from some of the most prominent lyricists today, including Lil Uzi Vert, Lil Yachty, Migos, 2 Chainz, Gucci Mane, ILOVEMAKONNEN, T Pain, and more.